Public speaking has always been a tough nut to crack. Sure, they say the more you do it, the easier it becomes. But what about when you only have to do it on rare occasions? It’s a scary proposition. In fact, it’s been found to be one of the top five fears among American people, according to a Chapman University study. Yep - it’s right up there with walking all by yourself at night. Eek! So, what’s a good way to overcome that crazy fear? Believe it or not, taking an improv class can help boost your public speaking skills tremendously. If you didn’t know, improv is a theatrical term that means that what is performed is created at the exact moment it’s performed. There’s no script. If you ever watched the show “Whose Line Is it Anyway,” you were watching improv in (hilarious) action. You may be wondering why improv helps so much with public speaking. Interestingly enough, it’s because of the useful business skills it requires. To effectively do improv, you must be able to quickly adapt to your situation, no matter how simple or sticky it may be. It also requires that you listen carefully, live in the moment and contribute to conversations with ease. An improv class is a fun way to help you cultivate and grow those skills. Confidence is key when it comes to public speaking. If you are thoroughly educated on the subject you’re talking about, you’ll feel much more confident when standing up in front of a crowd. Practice, practice, practice–and soak up every ounce of knowledge that you can. That way you can speak comfortably, with authority, and conquer any questions that come your way. 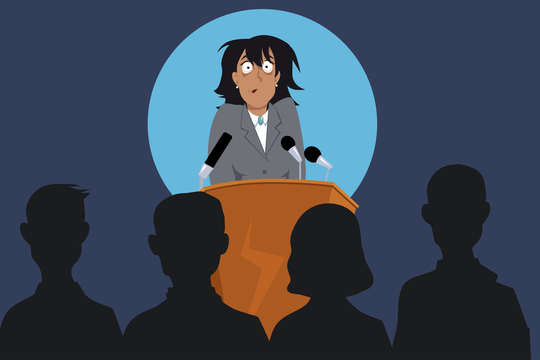 Avoid staying frozen in one spot, hidden behind the security of the podium. Limit shuffling your feet and fidgeting too. Instead, stand up straight and make frequent eye contact with the crowd. Get your hands out of your pockets and use them to be more animated as you speak. Now and then, take a commanding walk around the stage. Smile as often as it is appropriate. Days before your speech takes place, practice in front of a mirror or video yourself. This way you can see yourself as an audience member and can practice your improvements in your body language before the big day. Reciting a bunch of facts and figures by themselves can be pretty drab. Find the compelling stories in your subject matter and tell them with gusto. The more you humanize your subject, the better. People will more readily associate with what you’re discussing and be a lot more engaged as a result. Ask your audience questions and incorporate their answers into your discussion. Or bring people up on stage to help you make a point. Over half-way through your speech, do you see a bunch of yawners? Announce that you and everyone else needs to do a quick “7th-inning stretch” and literally get everyone up and stretch for a minute. Little things like this will make both you and your speech more memorable and interesting. Remember, in public speaking, improv is your friend, not your foe. Hope these quick tips help you to deliver your message without fear. Believe in yourself – you’ve got this! PS - And if you happen to be delivering your message via phone conference, we can help you out there too. magicJack for BUSINESS offers conference calling that is both highly reliable and cost-effective. Want to learn more? Give us a shout today!